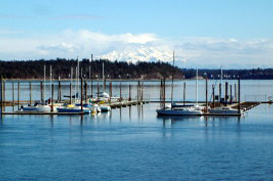 Steamboat Island is located 10 miles South of Olympia and 10 miles north of Shelton Washington. As you drive along the forest lined roads of Steamboat Island you almost forget you’re only a stones throw from the beautiful Puget Sound when out of nowhere you turn a corner and see the priceless views of the Olympic Mountains and Mt. Rainier just across the water. A true hidden gem of the Northwest Steamboat Island is just off the beaten path but well worth the trip.